So I’m finally getting around to blogging more 2018 weddings! The aim of the game is to have at least most of them on here by the time my 2019 season starts in March! Eeek. So here we go… Lucy & Alex! Ohhh myyy gaaaad I love these two. They’re just the best kind of people. It’s hard not to instantly like them as soon as you meet them! And WHAT a cool venue. Horselygate Hall is nestled at the bottom of the Cordwell Valley on the edge of The Peak District, just 10 minutes from Sheffield. Alex & Lucy got ready in the morning in the gorgeous self catering holiday cottages on site. As they’d already done the legal ceremony beforehand and were having a humanist ceremony on the day, they were happy to see each other before the wedding which meant they could greet all of their friends and family together without having to hide! Horsleygate Hall is surrounded by the most amazing gardens. So many nooks and crannies to explore! Alex had set up loads of outdoor games in different sections of the gardens, but you had to go exploring in order to find them! They also had a gin shack just at the top of the (incredible) orchard and there’s a random blue elephant hiding in the bushes by the main house! 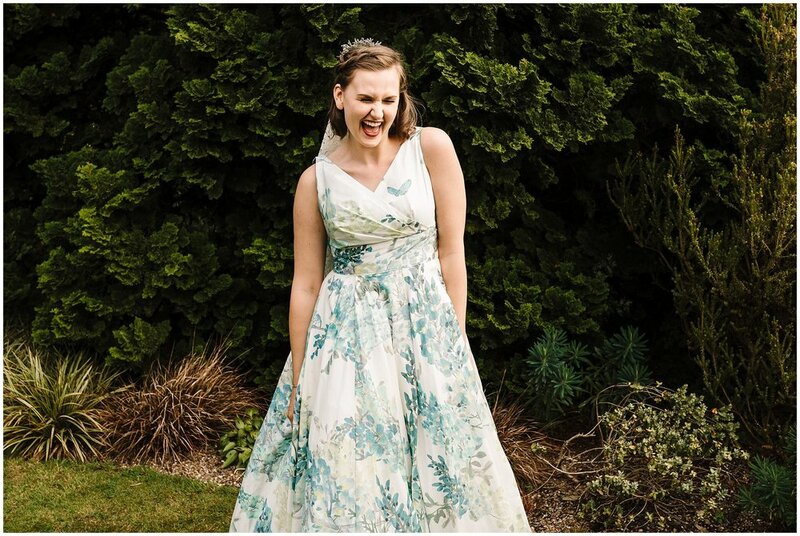 Lucy steered away from tradition with her awesome blue floral wedding dress, and her wedding shoes ruled! After many years of grief from one of my hips, last year I switched from Primark’s finest pumps to the memory foam heaven of Tom’s. So when I saw Lucy had gone for a pair of bridal Tom’s, I knew she was a girl after my own heart. Comfy wedding shoes FTW! Lucy & Alex wrote their own wedding vows and I almost had to swim through everyone’s tears (including mine!) to get into position for the first kiss! Totes emosh! It was a gorgeous humanist ceremony on the lawn. Umbrellas were whipped out for the 5 minutes of rain we had before Lucy walked down the aisle with her mum. They had the awesome idea of personalising drinking glasses for everyone, and instead of canapés to keep everyone going in the afternoon, they cracked into the wedding cake! Cake and champagne. Topping the wedding reception snacks charts right there. I snuck off with Lucy & Alex to make some quick portraits as they were keen to get back to the party. The one thing you might notice about these two is that they’re constantly laughing! Smoochy lovey dovey lightly posed photos are cute and it’s good to have some of those too, but I always feel like these are the portraits you’ll really treasure. Because these are the ones I would treasure. 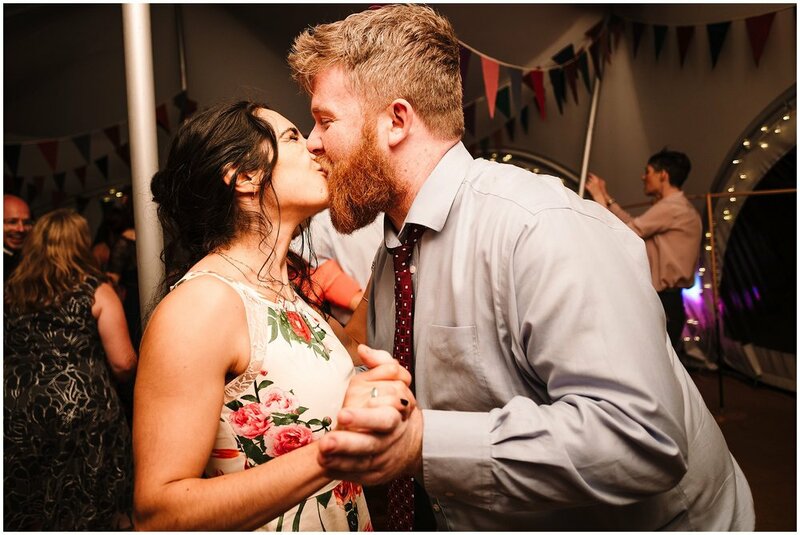 The natural ones that show just how much fun you had together on your wedding day and that also sum up your relationship and how you are as a couple. Now, I’d like to claim that they were cracking up at my amazing jokes, but they really do just laugh this much! By this point you probably won’t be surprised to hear that the speeches were both hilarious and emotional! Lucy & Alex also did a joint speech before everyone headed outside to tuck into an absolutely banging hog roast. The first dance was swiftly followed by some top notch flossing by the bride and groom, and a brilliant, jam packed wedding dance floor that rocked into the night! Thanks so much to Lucy & Alex for booking me and to their family & friends for being so welcoming and friendly!